Bloody airport security. Wot they gonna confiscate next eh? Fart guns that’s wot ! 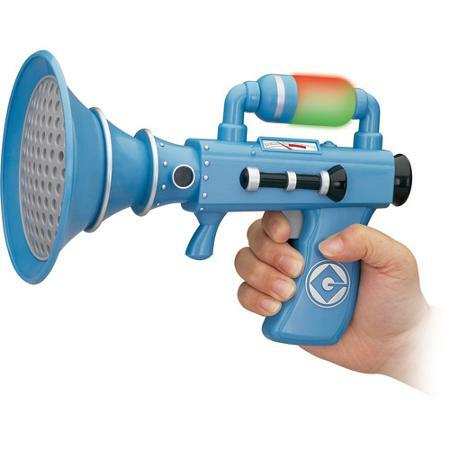 Yeh, that’s wot ‘appened to little Leo Fitzpatrick aged 3 when his Minions ‘fart blaster’ not allowed on flight as it has a trigger where rules classify it as replica weapon. Oi Security at Dublin Airport. Bugger Off and catch real security threats like those terris’ts pretending to be Grannies. PS: I don’t know about kids toys but I know some people (Clodius – I’m talking to you) whose real life flatulence would count a chemical warfare especially on a plane. PPS: Walmart has the offending item for $16.99. For an optional $2.00 you can get a 2 year warranty. How useful is that ! Excuse me, can you take me to Hades? There’s still plenty of time before the games in our Monday Dart League at Clover Leaf starts when I arrived so I parked and waited inside the car. I was busy with my phone oblivious of what’s going around the place when suddenly two Arab-looking guys, probably in their 40s approached me. Without a word, each opened the back seat doors and slumped themselves inside. I sat still feeling cold and terrified not knowing what to do. I waited for the worst thing to happen… a gun or a knife at the back of my head, demand for something. But they just sat there calmly looking at me. I slowly turned my head back to them cleared my throat and asked them, “What do you want from me?”, trying to sound as nice as I could. I heard an answer but I was too frantic to understand what they’re saying so I apologized and asked again politely, “I can’t understand, can you please say it clearly?” The guy on the left leaned forward and to my ear he said, “Are you Uber?”. With a big sigh of relief I answered back, “No, I’m not! I’m not an Uber driver!”. The two guys looked at each other and said, “Sorry, we thought you are.” And both got out of my car laughing… and I was laughing, too! Farmer’s Alamanac prediction: bloody freezing again. 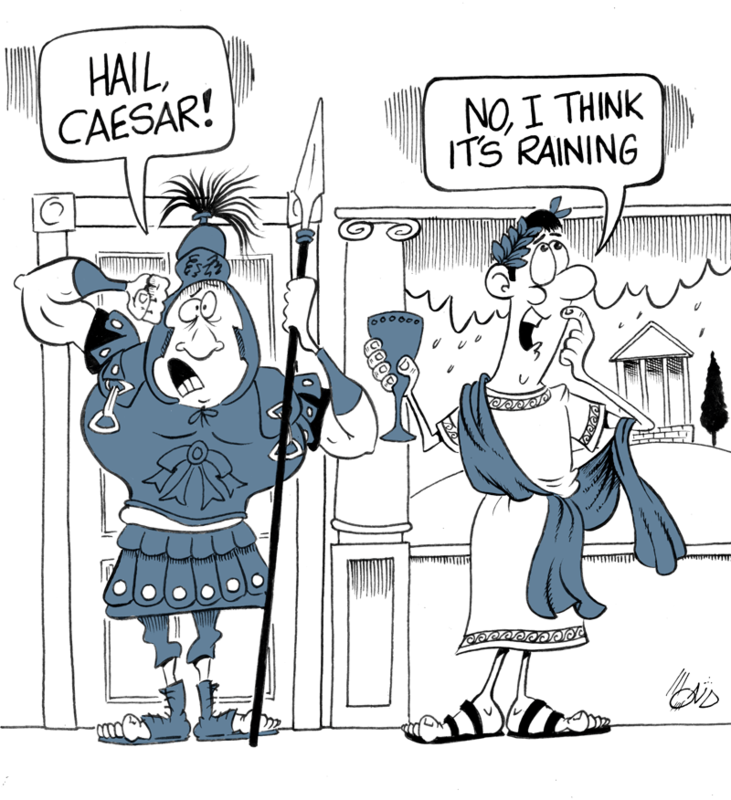 A very poor but original Roaman joke about the weather. I think we’d all agree that US 2014/15 winter was a harsh one. Well start looking for your warm clothing again as Farmer’s Almanac is saying 2015/16 is going to be more of the same and even places like Pacific NW is going to be hit hard with snow. California will get some rains but later in the winter it will revert to being dry. Another reason why if you are flying, to go through Southern airports in the winter but come to think of it, it didn’t matter for some airports like Dallas or even Atlanta were hit by winter storms. Maybe you should just stay in doors and read Roads-2-Roam.com articles moaning about the weather. Urgh, our sympathies to 10,000’s of you who were impacted by the computer malfunction at the air traffic center at Leesburg VA, which resulted in delaying all incoming and outgoing flights at all Eastern airports. 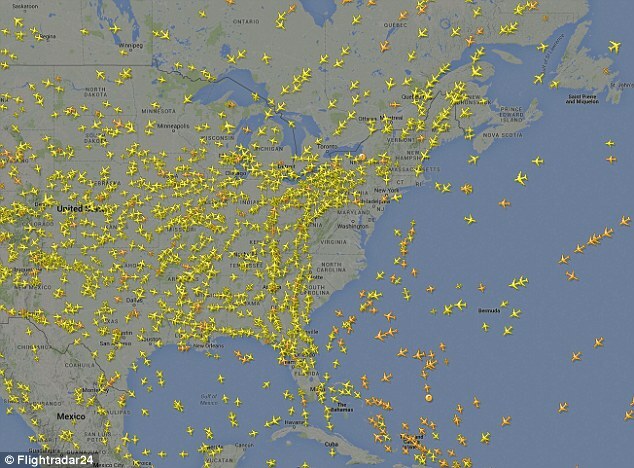 When the Washington control center stopped functioning, the TRACON serving National and BWI had no one it could hand flights off to as the planes reached cruising altitude. And East Coast flights — for example, a Miami-New York flight — were delayed or routed around the airspace controlled by the Washington center. So there you have it. At least you know why you were screwed. They say “no such thing as bad publicity” which in the case of National Corvette Museum, it is true. 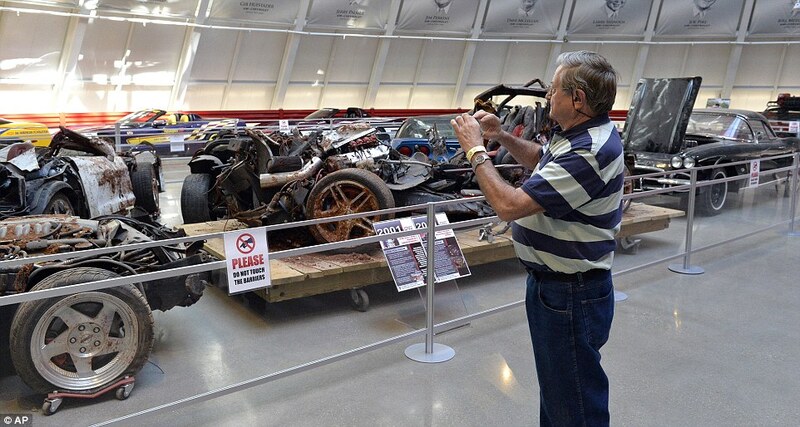 To recap this is where a giant sink hole appears inside the museum and sucked down 8 cars that were valued at over $1 million. Not only that but some of those cars were on loan. In the gift shop, jars of sinkhole dirt and rocks fetch $10 apiece. Nearly 2,400 jars had sold through July. Wanda Cohen of Roswell, Georgia, had just posted a photo of a wrecked car on her Facebook page. ‘It’s like looking at the worst wrecks you’ve ever seen,’ she said. For museum officials, the trick is to keep the site’s popularity from going in reverse now that visitors can’t gawk at the sinkhole. The museum cashed in on the giant chasm with record attendance and revenue in 2014. Last year, the museum just off the interstate drew 251,258 visitors, easily topping the 150, 462 visitors in 2013. The museum’s prior record attendance was 200,900 in 1999. Through last month, attendance for 2015 was off just 2.5 percent compared to the first seven months of 2014, the museum said. Look at the Southwest flight mag “The Magazine” and one thing you see every month is the adverts to hook people up. The idea is to appeal to the successful road warrior who is too busy with their career and lifestyle to meet the person of their dreams. Hey that’s no problem, the ladies with the perfect teeth at “Hey let’s hook you up” will arrange your perfect match. Really busy? then they can do it over lunch where you get to meet other similar time challenged people. Except if you are that busy with business travel, this is not exactly the foundation for a stable and loving relationship. Continue reading..
Wow. 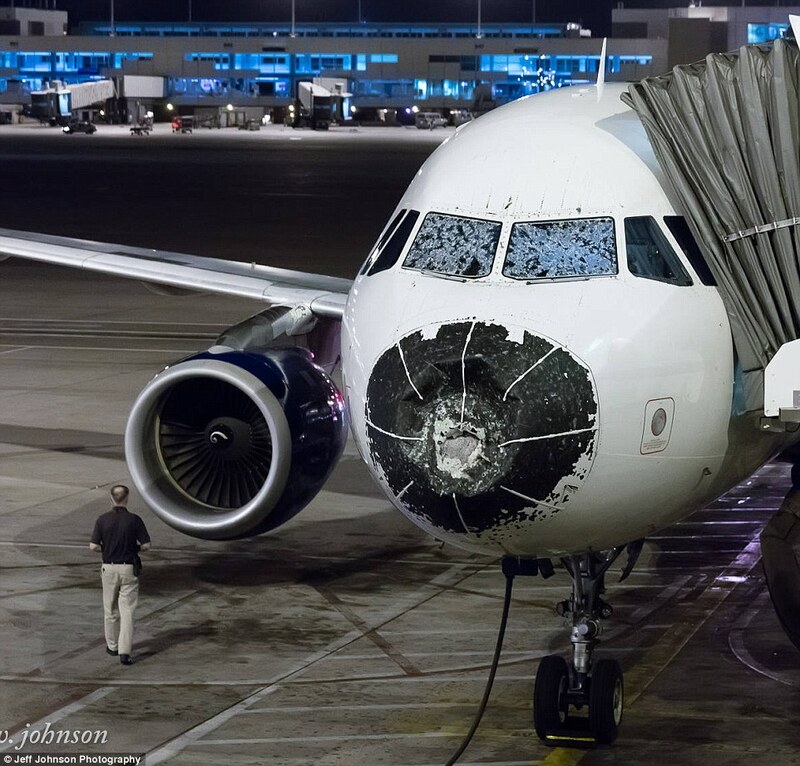 This was the damage to a Delta flight 1899 caused by hail the size of baseballs. The flight was going from Boston to Salt Lake City and had to divert to Denver. Due to the cracks in the windshield, the pilot had to make a ‘blind’ emergency landing relying on the plane’s automatic guidance system. That is impressive. Continue reading..
“No, it was there when I hired it but only noticed it the second day”, I truthfully said. The size of the chip was small in just to the right of the driver’s wiper. You wouldn’t notice it unless the sun was shinning directly on it. When I picked the car up, it was late evening and I only drove a few miles staying at the airport hotel while I waited for Mrs Caesar to come in on a late flight where she had missed her connecting flight. I did see it when we drove off the next day. Continue reading.. Right on cue for the peak August vacation time, poor old British Airways passengers are again experiencing baggage problems at Terminal 5 due to a power outage. While the passengers will make the flights, their luggage will not. A similar event had happened a week ago and just over a year ago an IT problem shut down the same terminal where people lost their luggage for over a week. (see BAGGAGE EXCESSES : PROBLEMS WITH BAGGAGE SYSTEM AT HEATHROW’S TERMINAL 5). You know what they say: Once is unlucky; twice is careless; three times is a pattern. Way to go T5. It is time to develop plan B.